Joseph Dziuba is a passionate 4th-year educator certified in mathematics (K-12) who works diligently to meet the needs of each individual that crosses his path. His passion for teaching and learning coupled with his vision of developing a community of leaders fuels his mission of cultivating a positive school culture and climate for all students and staff, built upon ideals of excellence and high standards. Recently, Joe published a blog post titled, Why You SHOULD Apply to a Doctoral Program. On this episode, Joe provides some insight into his program of study and research focus. 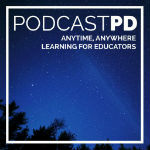 AJ: 1-3-20 Podcast → Recorded by Daniel Pink! In each episode, Dan will choose one book that has made an impression on him, ask its author three key questions and give you the most value possible in less than twenty minutes… Some Episodes include: Psyched Up – The Science of Mental Preparation, Everybody Lies and What Makes a Great Leader? Chris: New Media Show – The New Media Show is recorded live every Saturday at Noon EST. The weekly 90-minute show is hosted by Todd Cochrane (Blubrry) and Rob Greenlee (Spreaker). The series features the leading minds in the new media and podcasting space. Topics also include: new media and broadcasting events, media platforms, content monetization, platform apps, devices, content creation, publishing software and equipment. Joe: Revisionist History is Malcolm Gladwell’s journey through the overlooked and the misunderstood. Every episode re-examines something from the past—an event, a person, an idea, even a song—and asks whether we got it right the first time. From Panoply Media. Because sometimes the past deserves a second chance.